We are OEM with the most popular automation companies and have expertise to implement their products. We offer PLC, HMI and Variable Speed Drive programming as well as Soft Start and Motor Starter setup and commissioning (Allen Bradley, Omron, Siemens, Klokner Moeller, Modicon and others). Our workshop is Canadian Standard Association(CSA) approved for automation equipment manufacturing. We also have expertise with the most popular SCADA systems. These include Wonderware, Intellution and RSView from Rockwell. 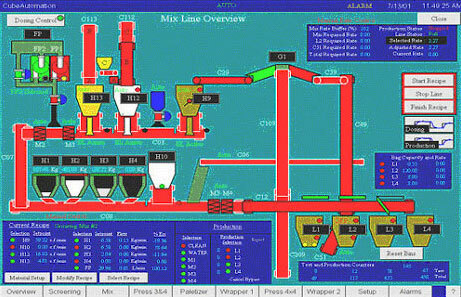 Programming and optimization of a Peat Mixing Line.